Sen. Richard Blumenthal (D-CT) announced Tuesday he would oppose Barr’s nomination, after he met with the nominee and he would not commit to releasing the report or complying with a subpoena from Congress for the report. “The defining question for me was his declining to commit to release the Special Counsel’s report fully and completely. He chose not to make the commitment that he would release that report completely and directly to Congress and the American people. The American people paid for that report—they deserve to know everything that’s in it,” he said. “He declined to say that he would not oppose a subpoena from a congressional committee for that report. He declined to say that he would permit Robert Mueller to testify without blocking it,” he added. 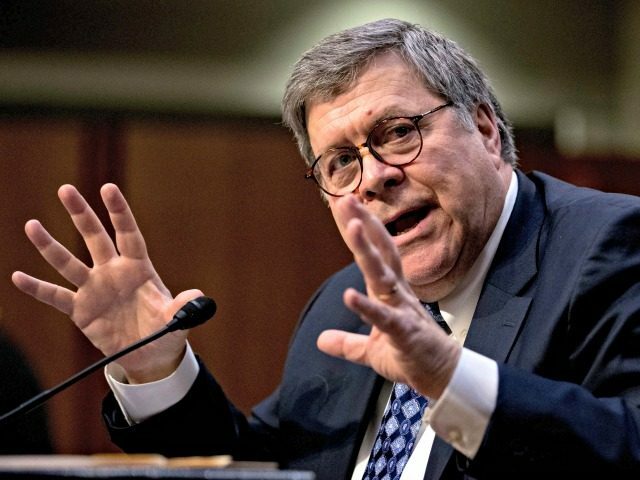 The opposition was unexpected, and Barr’s nomination is still expected to advance through the committee when it votes on Thursday, even if all Democrats oppose him. There are 12 Republicans on the Republican committee, and ten Democrats. The committee’s chairman, Sen. Lindsey Graham (R-SC), said Monday he expects a party-line vote. There are 51 Republicans in the full Senate, compared to 49 Democrats. The fight over Mueller’s report is heating up, amid signs the investigation could be wrapping up. Whitaker tookover overseeing the Special Counsel from Deputy Attorney General Rod Rosenstein in November, after Trump appointed Whitaker acting attorney general. Justice Department regulations call for Mueller to submit to the attorney general a confidential explanation why he decided to charge certain individuals, who else he investigated, and why he decided not to charge them, according to Washington Post. Once Mueller files his report to the attorney general, it will be up to the attorney general to decide how much information will be shared with Congress and the public, the Post reported. Trump told CBS on Sunday that it was “totally up to the attorney general” what gets released. Former FBI Director James Comey came under harsh condemnation from the right and the left, after he publicly announced the findings of an FBI investigation into former Secretary of State Hillary Clinton, and later announced that the investigation was reopening. Comey also broke with FBI policy to publicly confirm the existence of an investigation into whether the Russians meddled in the 2016 election and whether there was any collusion by the Trump campaign — even though the president was not personally under investigation at the time. Current and former law enforcement officials who have worked with Mueller told the Post they expect him to detail what he found about individuals charged with crimes, but be “far more circumspect” in discussing those not accused of any crimes. However, Blumenthal’s remarks indicate Democrats will fight to make Mueller’s report public, regardless of whether Trump is indicted. “The simple practical fact of the matter is that the Attorney General may conclude there can be no indictment legally of a sitting president, or there can be no indictments for other reasons,” he said. “If all of the findings and evidence are kept concealed, if there is no indictment and no disclosure of the findings, evidence, and facts, in effect, there will be a cover up and the American people will be deprived of the information they have a right to see,” he added. Senate Republicans have been in favor of allowing Mueller’s investigation to continue until its completion, and even be publicly disclosed. However, support for Mueller from Graham, a key Republican, soured a bit after the special counsel’s team authorized a pre-dawn raid on the home of Trump confidant Roger Stone, who was arrested, in front of CNN cameras. Graham last week demanded the Federal Bureau of Investigation explain why the raid was conducted in such a manner, when Stone, 66, was not considered a threat or a flight risk. “I am concerned about the manner in which the arrest was effectuated, especially the number of agents involved, the tactics employed, the timing of the arrest, and whether the FBI released details of the arrest and the indictment to the press prior to providing this information to Mr. Stone’s attorneys,” he wrote.